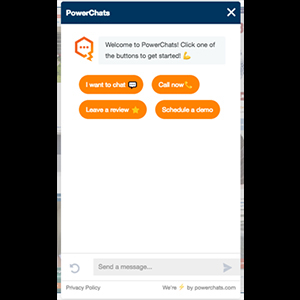 New PowerChats works by offering website visitors a user-friendly interface and a clear choice that allows them to dictate how they want to steer the chat. By offering consumers the ability to choose whether they want to chat, leave a review, schedule an appointment or call the business directly, potential leads arrive at their desired destination or outcome in less time. This results in more completed chats, more lead information captured and happier customers, the company says. Customizable interfaces, Facebook Messenger integration and a PowerChats demo are all available.